Like we said before, DC Comics decided, in 1983, to revamp Superman's two biggest foes in honor of the character's 45th anniversary. Marv Wolfman's idea for a fully robotic Brainiac was accepted, but he submitted a pitch for Lex Luthor, as well - one that was rejected. At the time. The winning submission came from Cary Bates, and saw Luthor don a new, powerful suit of armor. We've detailed previously where the armor came from, and Monkey Boy recently commented on how the armor is so identified with the character that creators just keep pulling it out of mothballs. Thing is, its "iconic" status is particularly surprising, especially when you consider that he only actually wore the armor for about two years before it was written out of the comics again. 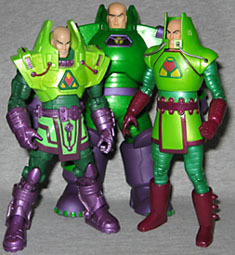 The Four Horsemen's take on the power armor is part of DC Superheroes Series 4. The main "themes" of the armor are the same - purple boots and gloves, dark green arms and legs, light green chest and skirt - but oh man, are the details ever different! The original design, by George Perez, was smooth and simple; an oddity from the guy known for his intricate details. The recent redesign took things even further, basically turning the armor into a seamless sphere with two triangles sticking out the side. The Horsemen eschewed this minimalist trend, thankfully, and packed the suit with the sort of technological we expect on advanced suits of armor. Woo! The figure is actually based on the articulation-added version of Mr. Freeze that was in DCSH3, though unless you've got the two standing next to each other, the similarities are anything but blatant. But does the suit capture the classic Lex Luthor look? His arms are banded metal, and though the gloves have the same basic shapes - large blacks on the back of the hand and the forearm, with diodes sticking out to the side - they're much bulkier and more technological. Instead of smooth boots with large spikes, he's wearing monstrous metal boots which seem to have pnuematic tubing to help drive them. The belt has the same kind of oval details on it, but not all the way around - there are two on the front, and two square pieces on the sides. His skirt is far more ornate, with purple designs in the green panels. The actual "armor" bits, the stuff on his chest and shoulders, is really nice. It's larger and blockier, and has tons more detail. The triangular symbol on his chest is thinner, but deeper, and the giant protective collar comes up higher and has a wider opening to allow him to see. 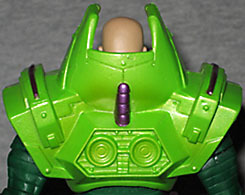 The back of the armor, which was plain and smooth in the original design, now features a pair of jet boosters in the back. He still has tubes running from his shoulders to his jawline, but they're thin and flexible on this version, as opposed to the hard plastic used on the DCD figure. The armor tops out at 6½" tall. The facial sculpt is really good - much better than the ridiculous, useless "calm" face on the Public Enemies figure. He doesn't quite look angry, though his brow is furrowed, showing off the Horsemen's command of wrinkles. It's more of an annoyed impatience. He's listening to another member of the Secret Society of Super Villains or the Legion of Doom or whatever explain his newest stupid plan to destroy the Justice League, and he's about two seconds away from slamming his fist on the table and telling Bizarro to just sit down and shut up. Articulation is really good. Lex moves at the ankles, shins, knees, thighs, hips, gloves, elbows, biceps, shoulders, torso and head. There might be a waist, but since the chest is a total balljoint, you can't really tell and you don't really need it. Both his head and his ankles have slight problems. Due to the way the boots are sculpted, Lex needs a big, wide-legged stance; a little bit wider than his skirt will actually allow. If his ankles had those ML-style rocker joints, you could stand him up straight, but no. Of course, the design doesn't really allow for them, but the feet are just a little bit too angled. His head is on a balljoint, but it doesn't have a good enough range of motion. Like so many DCSH figures, he can't look straight ahead; he's permanently looking down at the ground, unless you want to make him look like he's in a limbo competition. 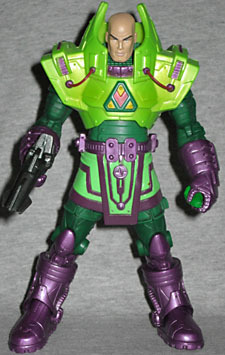 Unlike all those previous figures, Mattel's Lex has a couple accessories: a gun and a chunk of kryptonite. The kryptonite is translucent green, so it really catches the light and looks like a glowing, radioactive mineral. The gun is a nice grey, and looks like the type of futuristic ray gun seen in sci-fi movies in the '50s and '60s. Even by itself, this is a cool extra. But oh wait, there's more: ask yourself, what good is a gun against Superman? None at all, that's right. But Lex knows that, so he'd design around it. The rock fits in the top of the gun - obviously, it shoots kryptonite blasts. DC Superheroes Lex Luthor has a better design, better sculpt, better paint, better articulation and better accessory. It's even got a better price. Is there any reason to not recommend this figure? Well, the head joint, maybe. But other than that? No, not really. Once again, Mattel has schooled DC Direct. At the top of the review, we mentioned that Marv Wolfman had submitted a pitch for the Lex Luthor revamp, but that it was passed over. What was his idea? As detailed in The Krypton Companion, he wanted to turn Lex into a corporate business tycoon, an idea that would resurface post-Crisis in John Byrne's Man of Steel reboot. So the armored look lasted about two years, while the businessman version went on for two decades, culminating in the aforementioned "Public Enemies" story. At which point he adopted power armor. How very... cyclical. Imagine you're called into the editor's office - how would you revamp Lex Luthor? Tell us on our message board, the Loafing Lounge.